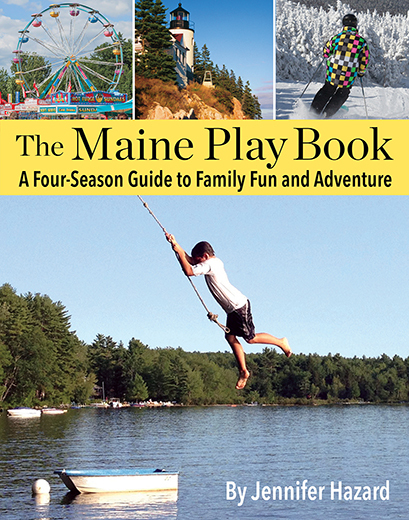 Folk, which is located in Kittery Foreside, is one of MP’s favorite new gift shops. Owner Amelia Davis has a great eye for design. 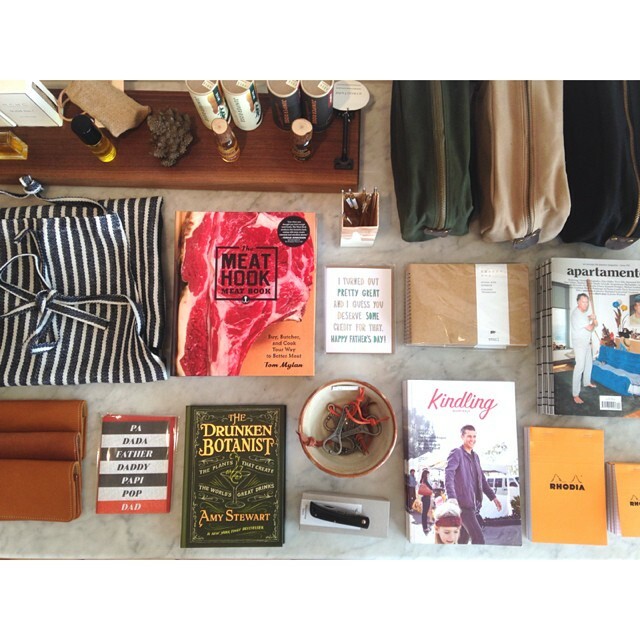 She offers lots of smart suggestions for Father’s Day gifts, but MP especially likes the striped Fog Linen apron (top left) and Maine made leather wallets from Nomad Leatherwork (bottom left). Amelia’s other suggestions include: canvas and leather dopp kit bags by Meyelo, “The Meat Hook Meat Book” by Tom Meylon, which offers tips on selecting and cooking locally raised meats, natural scents from Juniper Ridge Wilderness Perfumes and Dude No. 1 from MCMC Fragrances, plus travel notebooks from Rhodia. Last Father’s Day, we visited the East Ender for brunch and played soccer at Bug Light. It was such a fun day out for all of us. DP hasn’t revealed what he’d like to do yet, but MP has a feeling that a visit to Little Tap House in Portland might be in order. 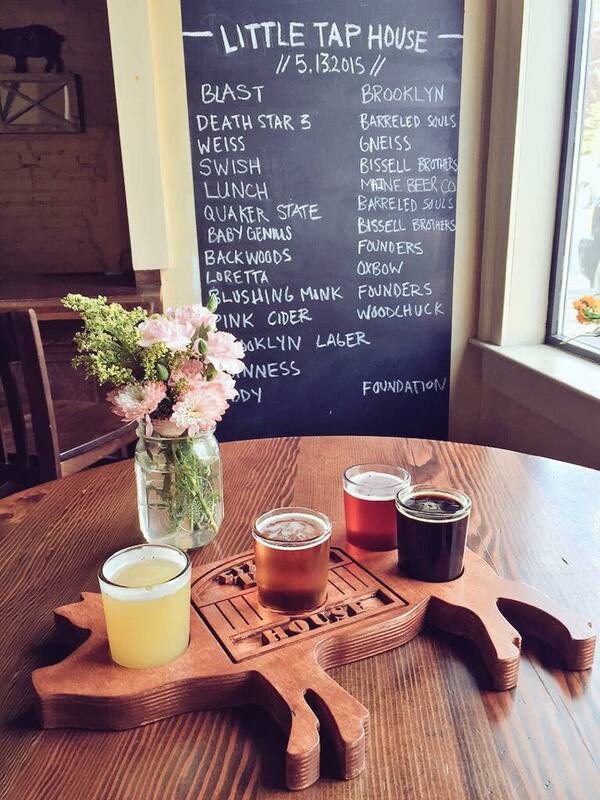 The cozy restaurant and bar is hosting a Super Dad Day event from 3-5 p.m. with a special happy hour. They call the event “Bring Your Own Baby,” but MP is hoping that 7- and 9-year olds can come, too. CP#1 and #2 are still her babies after all! Whatever your family has planned, we wish all the great dads, uncles, and grandfathers out there the happiest of Father’s Days! 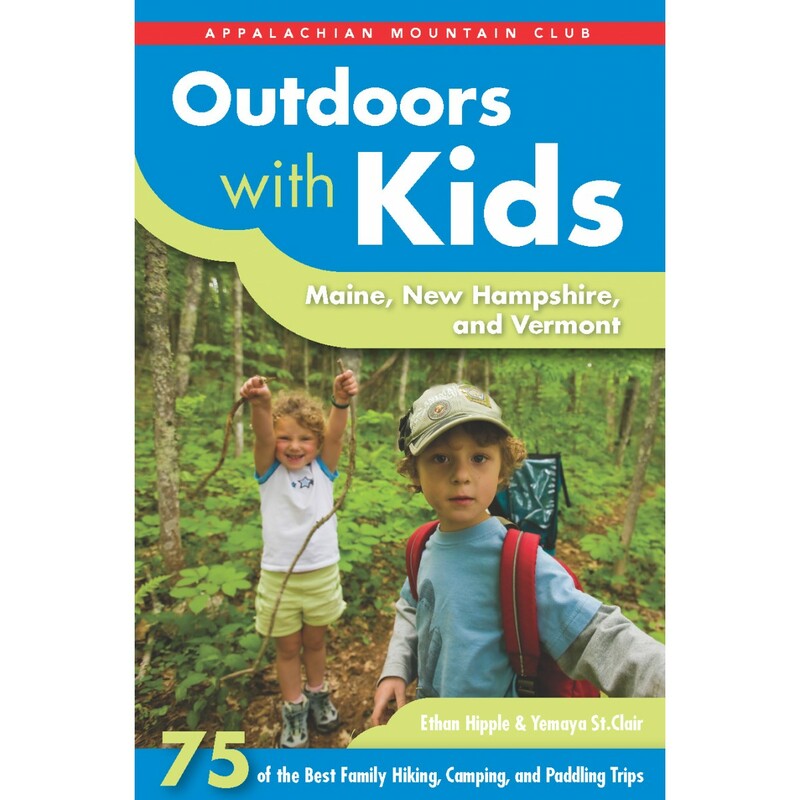 And before we forget, our kind friends at the Appalachian Mountain Club are offering a free copy of “Outdoors with Kids: Maine, New Hampshire, and Vermont” to one lucky Cute Potato reader. To enter, comment below and we’ll pick a winner at random. Contest ends Sunday, June 14, 2015 at midnight EST. Good luck! PS: Some other ideas for Father’s Day here. Plus plan a family trip outdoors using this AMC site. Always looking for new outing ideas. This book looks great! AMC is a great organization! We would love another one of their books. Great ideas! I didn’t know Folk had stuff for the guys too. We have a 5-month-old babe and we are SO excited to spend time outside with her and show her all of the beautiful outdoor places that we love in ME and NH. We’d love the AMC kids book and we’d use it for many years to come! What a great giveaway! This would be a perfect gift for my active kiddos to give their daddy this Father’s Day. Enjoy your weekend!! what a great opportunity to get a non-camping family outdoors and enjoying the trails! Great suggestions! That book would be a fabuloys resource for our family!